This delicious dish inherited from Spain is a must for the fiesta table. 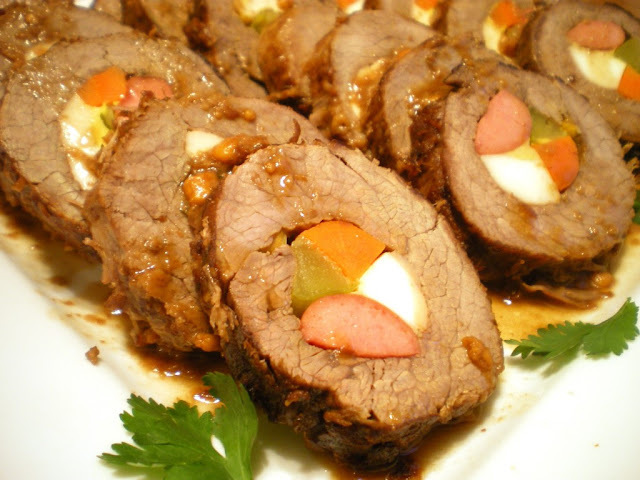 The meat roll is simmered in a rich tomato sauce until juicy and tender. 1 Marinate the beef for 20 minutes in the lemon juice, soy sauce and pepper. Drain and reserve the marinade. 2 Lay the beef on a flat work surface. Arrange the Filling in rows lengthwise. Roll the meat lengthwise along the grain to enclose the Filling and tie in several places with kitchen string. Then dredge the meat roll in flour and shake to remove excess flour. 3 Heat the oil in a large saucepan and brown the beef on all sides. Remove the meat from the saucepan and set aside. Add the reserved marinade, garlic, onion, tomato purée and bay leaves, and cook over high heat until the liquid is reduced. Add the beef stock and bring to a boil. 4 Add the beef roll, reduce the heat and cook on a slow simmer for 1 hour or until the meat is tender. Season with salt, pepper and sugar. 5 Transfer the meat roll to a platter, remove the string and slice crosswise into 3/4-in (11/2-cm) thick slices. Reheat the gravy and drizzle over the meat just before serving. Freshen the dish with the lemon juice and garnish with parsley, if using.